On Sunday, July 24, over 2,000 athletes competed in the 13th Ironman Lake Placid. Last year’s winner, Ben Hoffman, was back to defend his title (coming off several 70.3 wins over the past year, including Branson, Boise and Munice), but he faced a tough men’s field, including Luke Bell (Hawaii 70.3 champ), Eduardo Sturla (IM Brazil winner), and TJ Tollakson (coming off a solid race at IM St. George and a win at Eagleman). Tollakson led the race from nearly the get-go. He came out of Mirror Lake in second (to Holden Comeau) by just under a minute and took the lead on the bike almost immediately. He nearly broke the course bike split record (off by only 10 seconds) and held the lead through the run to secure his first Ironman win. TJ is a long-time TrainingPeaks user and shared his race report and winning power data file with us. 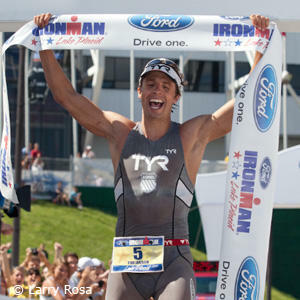 My primary goal for 2011 was to win an Ironman. To accomplish this goal I decided to schedule two Ironman races for the season outside of Kona. My first Ironman of the season at St. George went well, as it was another podium finish, but I struggled on the bike and early run with an upset stomach. I managed to come back on the run and put together a solid finish, but I knew I left a lot on the table that day. After St. George I put my focus on Ironman Lake Placid. I raced a pretty light schedule in between with only one 70.3 at Eagleman which I won, but also knew I was focusing on the Ironman. While a little tempted to race another 70.3 before Lake Placid, I had to remind myself to keep my eye on the donut and not the hole. I was going into Lake Placid with a great and very specific training block thanks to my coach, Cliff English. My workouts were going extremely well and I felt perfectly prepared for my best Ironman yet. Lake Placid will forever be remember for the “Miracle on Ice” during the 1980 Winter Olympics when USA beat the heavily favored Russians and took home the gold medal. I was hoping to capture some of that “miracle” in Lake Placid and capture my first Ironman win. I traveled to Lake Placid on Wednesday and had a great homestay with Charlie Cowan (local endurance stud) thanks to Scott Lukan. I had a long day of travel, flying into Burlington then driving over to Lake Placid (which included a ferry ride). I made it in late, grabbed some dinner with Charlie and his son, Sam, and then went for a short run at dusk to shake out the legs. I lounged around most of Thursday – then Friday was a very busy day as I did a signing with Zipp at Placid Planet Bike Shop, interviews for IronmanLive and Universal sports, the press conference, pro meeting, and a signing with TYR at the Ironman expo. I was ready for the day to be over and thankfully my mom and sister came into town and picked up Ashley from Burlington. Saturday was a more relaxing day and it was nice to have Ashley around to help with the final race prep. Race day started with a 4:20 wake-up call and breakfast immediately following. I started the day with two Ensure Plus chocolate shakes and a whole-wheat bagel with PB and J. One can of Red Bull was enough to spike my energy for the morning. I went down to the transition area and prepped my bike. I had a sweet SRM telemetry responder on my rig which would provide live HR and Power Data during the race. There was a morning announcement that the swim would be non-wetsuit legal, which was only more exciting for me. I dropped off my special needs bags with Ashley then had one pack of PowerBar Gel Blasts and another can of Red Bull. I hopped in the water for a short warm-up and felt great in the water. I started on my usual spot, just on the outside of the main pack. About 200m into the swim, I converged onto the buoy line shoulder to shoulder with Holden Comeau, the swim leader. Half way through the first lap, Holden put in a surge away from the buoy line. I had no interest in wasting the energy to chase him off the line, and knew he wasn’t a serious contender because wasting that energy would not be the race plan of a contender. I was left behind; swimming with Luke Bell and on the second lap, came around Luke to do the work and came out of the water second about a minute behind Holden. After a quick transition I was on the bike and settling into my Ironman pace. I went a bit harder at the start of the race but it only took about 5 miles to take over the lead of the race and then it was no looking back. About 20 miles into the bike, Luke Bell was no longer right behind me and I was comfortably cruising at my own pace. Ben Hoffman was making up some time on me during the first lap of the bike, but he was never closer than a minute behind. It’s always hard to get accurate splits when I’m in the lead. I came through lap one on the bike in 2:15 and knew I was on track for a great bike split. I just had to hold my pace and keep it steady. I stuck to a strict nutrition plan of one gel every 20 min on the bike. I had three bottle flasks (from RusterSports.com) mounted on my bike each with 5 PowerBar Energy Gels. I had one flask with Raspberry Cream, one with Berry Blast (for the caffeine in the middle of the bike), and one with Kona Punch. At mile 60 I took one packet of PowerBar Gel Blasts, Cola flavor. I finished all 15 gels at the end of the bike and was ready for a run. I felt as good at the end of the bike as I did at the beginning (well, almost). I knew I was ready to really rock a solid marathon. I started out with the first downhill out of transition in 5:50, but knew I was fine because it was downhill. I settled into a solid 6:20 pace for the first half, and then slowed to 6:30 avg by the 20 mile mark, but still on a 2:50 pace. I ran the first half of the marathon continuing with my plan of one gel every 3 miles and water. I had two cans of Red Bull at special needs, and finished the run using cola and water. I made a few mistakes as it was a bit warmer than I anticipated (and the forecast called for), so I was a little hyponatremic on the run, but nothing I haven’t dealt with before. Salt Stick caps will be important in Kona. I knew I had a really big lead at that point, and the advice from the coach was to shut it down and run a bit easier to the finish to aid in the recovery. We always talk about the recovery process starting during the training and racing and this was an important call for recovery. Since this was my first Ironman where I wasn’t racing to the wire, this was my first time slowing significantly (on purpose) at the end. Post race, I spent an hour chugging water for drug testing then Ashley and I went to the Breakfast Club, etc for a big burger and some cheese fries! I returned to the finish line at night to watch the last finishers beat the 17-hour time mark. The crowd at midnight was huge and super energetic. It was the perfect nightcap for my first Ironman win. I went to Wise Guys with Elizabeth Whitmaack, her fiancé Chris Kaplanis, Chris’s mom, Alice, and their friend Travis. We had a great recap of the day and some more grease and salt (everything my body craves after an Ironman). I want to thank all my sponsors for their support, I couldn’t race without them. Bike: Vintage 1996, Zipp 2001 bike modified and branded Dimond (by Ruster Sports), SRAM Red Groupo 54 TT chain ring, Casco Carbon Warp Helmet, Profile Design Cobra base bar, Cobra T2 extensions, Aris 130mm stem, Profile Design RMC rear mounted hydration and Karbon Kage in the front, Zipp 808 Firecrest Carbon Clincher Front Wheel, Zipp 900 clincher disc rear wheel, Maxxis Xenith Equipe L’egere tires, Fizik Arione Tri saddle. Run: K-Swiss K-Ona shoes, Ruster Sports Quick Laces, CEP Progressive Compression Socks, TYR Carbon Collection, TYR Visor, Oakley Jaw Bones eyewear. The entire TrainingPeaks team wants to say “Congratulations!” to TJ. He’s a great athlete and a true testament to how hard work and attention to training details can really pay off. We’re looking forward to watching him win more races in the future!